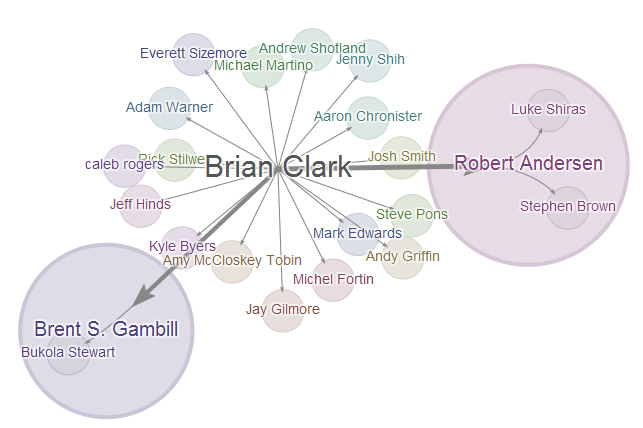 How to *Own* Google+ Using Sparks and Ripples (and gain friends and influencers in the process). What makes Google+ truly different from Facebook? Besides the lack of ads, game spam and privacy issues, Google+ has two excellent features that are worth paying attention to: Sparks and Ripples. 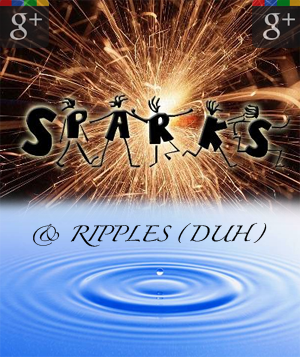 Google+ Sparks are like an advanced combination of Google Alerts and Google Reader – without the dashboard and inbox clutter. Sparks let you use Google’s own query language to set up improved filters for the information you care about. You can then save your searches and have them appear under “Sparks” when you’re logged into Plus. 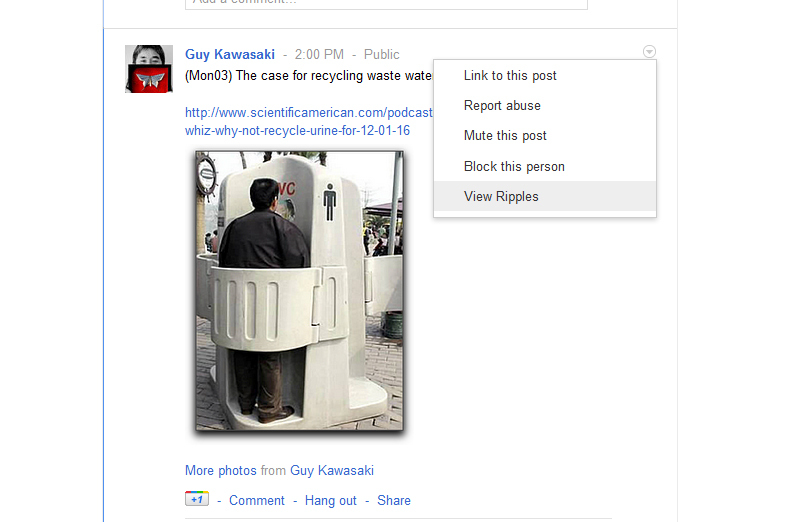 Now, I could save this search – but it would likely clog up my Google Plus dashboard in a heartbeat. Instead, simply click the “Everything” down arrow and choose Sparks. Currently, Sparks only let you see the most recent posts related to your search. 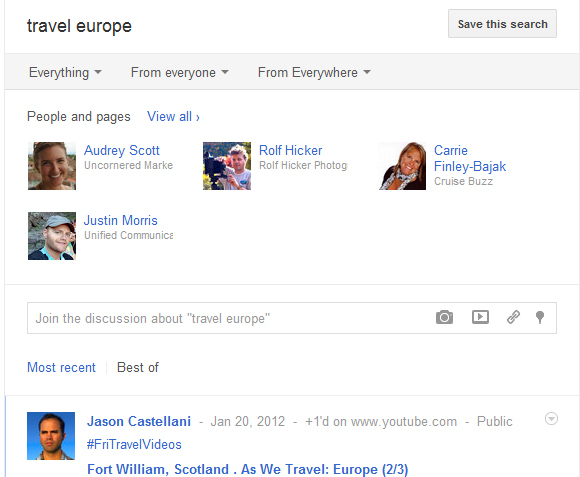 If you click “Save this Search”, you will see your sparks listed under the “What’s Hot” section of your Google Plus stream. You can also +1 (share) any Sparks you come across, to people within the circles you choose. It’s a great way to not only filter information for your own knowledge and use, but also a way to keep participants in your circles “in the know”. Find informative, interesting or other newsworthy tidbits by finding and saving Sparks to your Google+ dashboard, where you’ll always have one-click access to the latest details from the web regarding your saved searches. Use Google’s advanced query language to filter your Sparks so that you only get relevant information and not every keyword-stuffed article that slithers across the net. Regularly share pieces with people in your circles who could benefit from them. While Google+ is still rolling out new features and tweaking its user interface, I would personally love to see a way to further refine Sparks by selecting to get updates only from specific websites, people or places. Ripples are an appropriately-named feature that lets you see who the biggest thought-leaders and influencers in your industry are, as well as who they’re sharing with, and how large their audience’s “ripple-effect” is. Case in point – Guy Kawasaki, of Apple Marketing and “Enchantment” fame, has a huge circle of influence. Like tossing a pebble into a pond, whenever he posts on Google+, it gets noticed and picked up by other people who have him in their circles. Guy Kawasaki making ripples on the case for recycling waste water. Keep in mind, Ripples will only show if the post has any +1s – and only recent public shares are shown. Although ripples only tally and track shares between Google+ users, it’s a great way to see who’s promoting your posts, and how far your reach can spread. This is also a great way to add other influencers to your circle who may not have the name recognition that the original poster has – but are more likely to share posts. Use Ripples to effectively determine who has the largest sphere of influence within your circles. Ripples are a great way to determine how “viral” a post has gone – and should give you some fantastic ideas on how to capitalize on that trend. Ripples will give you a closer look at what spurs your audience to take action. Currently, if your post has comments, they don’t count toward the ripple effect. Likewise with any private shares. This kind of visual glimpse at who’s sharing what can help you tweak your strategy to likewise increase shares and/or comments. Using Google’s own search language together with Ripples can help you find local influencers to connect with – this article on Search Engine Land explains how to do it in three easy steps. As with most types of social media, the more you use these features, the quicker you can build up your network of circles and potentially get the attention of the fire-starters in your industry. The fact that Google is finally starting to bring together all of its services into one cohesive strategy means that you can expect features like Ripples and Sparks to play a more active role in search rankings. Now if only Facebook would roll out something similar!